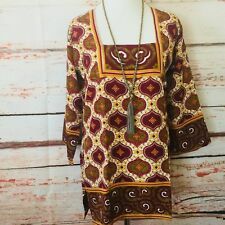 Indian L/ XL Kurta Kurti Ethnic Top blue patterned w/ crochet trim Tunic. Condition is Pre-owned but no condition issues. Medium weight cotton patterned. On material. Crocheted trim neck and arms with snap closures. Does not have to be a cultural item ...can be worn by all. Bust is 48" hips are 46" with large vents. Sleeves are long wirh snaps. Length is 32"
Brand New XL - chest 44"